Admittedly, this somber assessment came at a time when China's H7N9 virus appeared on the decline, and after HPAI H5 had gone mysteriously silent across Europe and North America following the summer of 2015. 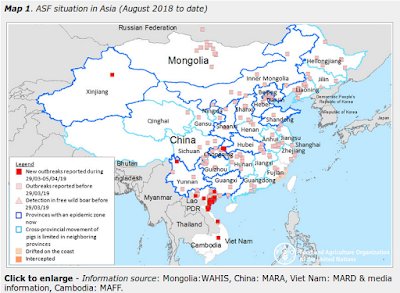 In June of 2016, in Sci Rpts: Transmission & Pathogenicity Of Novel Swine Flu Reassortant Viruses we looked at another study - again out of China - where researchers experimentally infected pigs with one of these Eurasian-Avian H1N1 swine influenza viruses and the 2009 H1N1pdm virus. While human infection with EAH1N1 in China is only rarely reported, last September, in EID Journal: Reassortant EAH1N1 Virus Infection In A Child - Hunan China, 2016, we looked at a report of a boy with severe pneumonia who was infected with a reassortment of - you guessed it - EAH1N1 and the 2009 H1N1pdm virus. The virus contained 2 surface genes from an EA-H1N1 virus and 4 internal genes from A(H1N1)pdm09 virus. Compared with JS/1/11 EA-H1N1 virus, the reassortant virus exhibited higher infectivity, virulence, and replication in C57BL/6J mice, demonstrating the need for further evaluation of HuN EA-H1N1 virus to assess the threat it poses to public health. Our results indicate the need for heightened surveillance. All of which brings us to a new open access study, appearing this week in the Journal of Virology, that finds - among other things - that a single amino acid (AA) change in the HA of the EAH1N1 virus significantly alters its tranmissibility in the guinea pig model. A number of researchers in today's study - including the lead author Hualan Chen - were part of the 2015 PNAS EAH1N1 study research team. Efficient transmission from human to human is the prerequisite for an influenza virus to cause a pandemic; however, the molecular determinants of influenza virus transmission are still largely unknown. In this study, we explored the molecular basis for transmission of Eurasian avian-like H1N1 (EAH1N1) swine influenza viruses by comparing two viruses that are genetically similar but differ in their transmissibility in guinea pigs: the A/swine/Guangxi/18/2011 virus (GX/18) is highly transmissible by respiratory droplet in guinea pigs, whereas the A/swine/Heilongjiang/27/2012 virus (HLJ/27) does not transmit in this animal model. We used reverse genetics to generate a series of reassortants and mutants in the GX/18 background and tested their transmissibility in guinea pigs. We found that a single amino acid substitution of glycine (G) for glutamic acid (E) at position 225 (E225G) in the HA1 protein completely abolished the respiratory droplet transmission of GX/18, whereas the substitution of E for G at the same position (G225E) in HA1 enabled HLJ/27 to transmit in guinea pigs. We investigated the underlying mechanism and found that viruses bearing 225E in HA1 replicated more rapidly than viruses bearing 225G due to differences in assembly and budding efficiency. Our study indicates that the amino acid 225E in HA1 plays a key role in EAH1N1 swine influenza virus transmission and provides important information for evaluating the pandemic potential of field influenza strains. IMPORTANCE Efficient transmission among humans is a prerequisite for a novel influenza virus to cause a human pandemic. Transmissibility of influenza viruses is a polygenic trait, and understanding the genetic determinants for transmissibility will provide useful insights for evaluating the pandemic potential of influenza viruses in the field. Several amino acids in the hemagglutinin (HA) protein of influenza viruses have been shown to be important for transmissibility, usually by increasing virus affinity for human-type receptors. In this study, we explored the genetic basis of the transmissibility difference between two Eurasian avian-like H1N1 (EAH1N1) swine influenza viruses in guinea pigs, and found that the amino acid glutamic acid at position 225 in the HA1 protein plays a critical role in the transmission of EAH1N1 virus by increasing the efficiency of viral assembly and budding. As we've discussed previously (see Differences In Virulence Between Closely Related H5N1 Strains), it sometimes only requires a small change to an influenza virus to change its behavior in a major way. Recently we've been watching a small AA change (N121K) in clade 3C.2a1 of the seasonal H3N2 virus, that appears to reduce the efficiency of the current flu vaccine. A mutation in the 2009 H1N1 virus (see EID Journal: Emergence of D225G Variant A/H1N1, 2013–14 Flu Season, Florida) has been shown to increase virulence and promote deep lung infection. And the H275Y mutation is the most common mutation that confers resistance to NAI antivirals. Other changes - often in combinations of AA sites - can affect receptor cell binding, replication rates, and adapatation to lower temperatures found in the human airway. All important traits for any flu virus with pandemic aspirations. While much has been learned about these changes in the past decade, the impact of many of these amino acid substitutions remains a mystery. Learning about these combinations can hopefully tell us when viruses in the wild are getting closer to becoming a pandemic strain. After outlining all of the results of their testing, the authors of today's study reiterated their previous assessment. In the present study, we explored the genetic basis for the difference in transmissibility in guinea pigs of two EAH1N1 swine influenza viruses, GX/18 and HLJ/27, and found that the single amino acid mutation E225G in HA1 abolishes the transmissibility of GX/18, and that the mutation G225E in HA makes HLJ/27 highly transmissible in guinea pigs. We further investigated the underlying mechanism and demonstrated that viruses bearing 225E in their HA1 replicate more rapidly than viruses bearing 225G in HA1 due to differences in their assembly and budding efficiency. Two lineages of H1N1 SIVs, classical H1N1 SIVs and EAH1N1 SIVs, have been circulating in pigs since 1918 and 1979, respectively. The classical H1N1 SIVs emerged in humans as a reassortant and caused the 2009 H1N1 influenza pandemic, and the HA gene of 2009/H1N1 also belongs to the classical H1N1 SIV lineage. Our present study and a study by Tumpey et al. (10) indicate that 225E and 225D in HA1 play important roles in the transmissibility of EAH1N1 SIVs and classical H1N1 SIVs, respectively. We checked the HA sequence of the H1N1 SIVs and found that 225G was present in the HA1 gene of the majority of strains detected before the year 2000; however, the number of classical H1N1 SIVs that contain 225D in HA1 gradually increased after 2000 and became predominated after 2009 (Fig. 10A), and the EAH1N1 SIVs that contain 225E in HA1 showed a similar tendency (Fig.256 10B). These findings suggest that the pandemic potential of the EAH1N1 SIVs is increasing. While EAH1N1 is the prime swine-origin virus of concern in China, it isn't alone (see Front. Microbiol. : A Novel H1N2 Reassorted Influenza Virus In Chinese Pigs), and similar swine flu evolution continues in North America, Europe, Brazil, and undoubtedly many other places where there is (unfortunately) little or no surviellance.